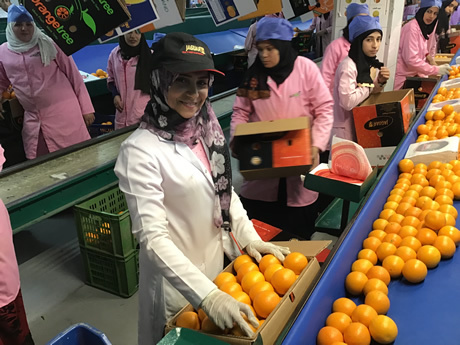 "Year-round FairTrade oranges after certification of our Egyptian partner, Agroland"
Jaguar The Fresh Company's Egyptian partner, Agroland, has been Fairtrade certified. With this, Jaguar The Fresh Company can offer its clients Fairtrade certified oranges year-round. This is in addition to its South African assortment. Last year, this Dutch fruit importer guided its Egyptian partner. They helped them in the areas of food safety, the necessary certification, the cultivation and new variety development, as well as in social aspects. In Mid-December, this resulted in the so-called 'Permission to Trade’. After the implementation of a few improvements, this will undoubtedly lead to a Fairtrade certificate. "We, at Jaguar, took the initiative toward gaining this certification. We saw that our clients were becoming increasingly interested in the social side of our sustainability policy", says Pascalle van Bergenhenegouwen, Quality Manager at Arbo & Milieu (KAM). "We already get Fairtrade citrus from our South African partner. Now, with Agroland, we can offer this year-round. The certificate is a good way to take the sustainability level up a notch. For Agroland it is quite something. For example, workers, except for those in management, have to be elected for the Fairtrade Committee. They then serve as an official employees representative." "It is no easy task to meet the Fairtrade requirements. My colleague, Sven Thomas, spent a lot of time in Egypt over the past year. There, he guided our supplier through the process," he continues. "Jaguar pays Agroland a Fairtrade premium. This money is used as savings which Agroland must spend in a way that benefits their staff. For example, it can be spent on childcare or a minivan for the workers." "In collaboration with SMK, we are busy setting up PlanetProof certification for our North African growers. These are mostly aimed at environmental issues. With the Fairtrade certification, we can also safeguard social conditions. In recent years, Fairtrade and similar social standards were 'nice-to-have'. We, however, expect that, increasingly, these will become the norm," says Pascalle. When asked if Jaguar is not shooting itself in the foot by paying a Fairtrade fee in a market that already has tight profit margins, the KAM-Manager answered, "A Fairtrade premium is separate from these tight margins. These are a result of a lack of marketing and added value. Our Fairtrade oranges are not only sustainable. They are also of high quality, always nice and fresh, and have a high juice content." "We expressed the wish internally that we would like to set up similar projects for our other key products. Hopefully, this partnership with our Egyptian partner, Agroland will take us one step closer to achieving that,"concludes Pascalle.